BIOSIN is a registered PROBIOTIC, act 36 of 1947. BIOSIN consists of the same culture of Lactic Acid Bacteria as in BIOREM. It is a liquid form, with more claims and application possibilities. The strains of Lactic Acid Bacteria in BIOSIN are specially selected for a strong growth potential, as well as for its antagonism against pathogens. It also has a good resistance against certain conditions that normally reduce the concentration of “good” bacteria in the digestive tract. When the animal is administrated with the culture of Lactic Acid Bacteria in BIOSIN, it starts to increase rapidly. 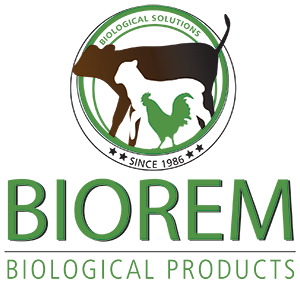 The conditions in the rumen and lower digestive tract are ideal for the growth of this group of bacteria. The bacteria establish on the mucosa of the digestive tract to remove and replace the pathogenic micro-organisms. In this way the micro ecosystem is brought into balance. When enough Lactic Acid Bacteria are present, it dominates the population in the gut while an anaerobic situation is established. Bacteriosin is an important excretion of Lactic Acid Bacteria, with an antagonism against pathogens. Due to the fact that the most important pathogenic organisms prefer an aerobic milieu and, together with the antagonistic working of the bacteriosins excreted by the Lactic Acid Bacteria, their numbers start to decrease drastically. The administrating of BIOSIN does not only treat and prevent certain stress-related pathological conditions, but also increases the animal’s general health. 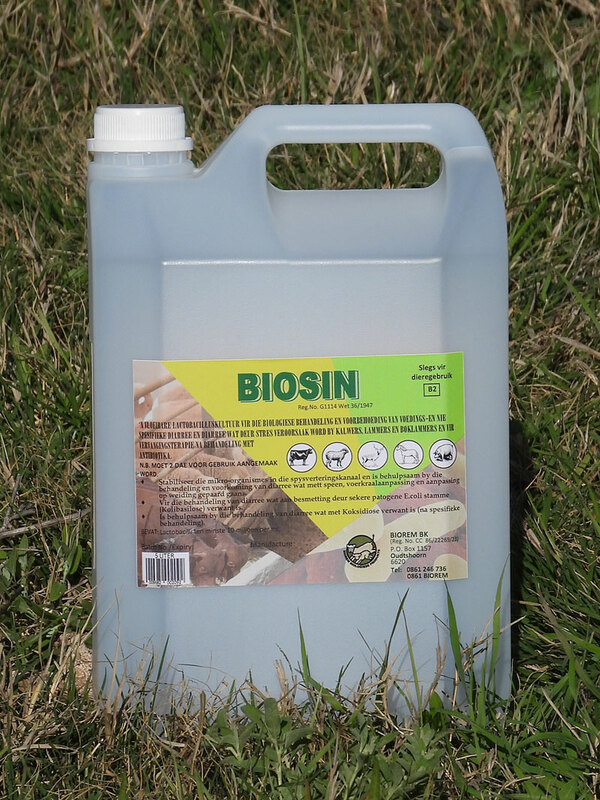 BIOSIN contains, after incubation, approximately 10 to 100 million Lactic Acid Bacteria per millilitre. Incubation occurs when the bacterial “vaccine” (included in the content of the plastic bag), is allowed to increases in the growth medium (a mixture of water and the content of the plastic sachet). 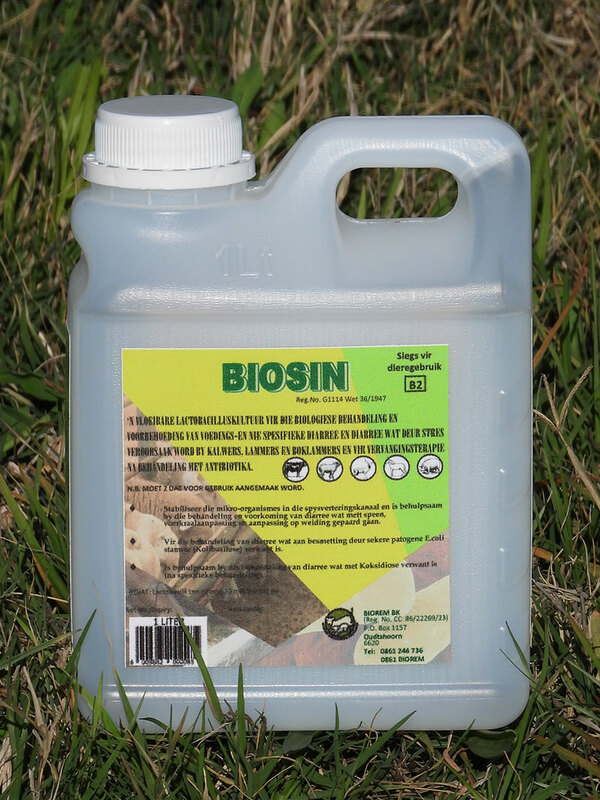 BIOSIN is administered to animals with a dysfunction of the digestive tract due to an insufficient micro-organisms population. BIOSIN is used to replace or replenish the microbe-population after antibiotic treatment. BIOSIN can be used as a remedy for diarrhoea. OSTRICHES: The use of BIOSIN in ostrich chicks 3 days post hatching, increases their chances to survive drastically. Chicks start to feed earlier. The product for ostriches is registered as BI-OSTROSIN (V12928). Dosage: 1ml BI-OSTROSIN per chick per day; BIOREM-PLUS 1g per chick on food or 2kg per ton. FEEDLOTS: BIOSIN administrating to calves or lambs during processing at intake in the feedlot reduces adaptation problems noticeably. They start feeding much sooner, less diarrhoea occurs, less animals have to be treated in a hospital camp and a saving on the costs of antibiotics is experienced. It prevents Coccidiosis and Salmonella, as well as a successful treatment of Acidosis in lambs. SHOW BIRDS AND PIGEONS: BIOSIN minimises losses especially under stress situations. BI-AVISIN has been developed and has to be administered orally or in drinking water at 0,5ml per bird per day, before, during and/or after transportation or any other stress situation. BROILERS: BIOSIN reduces levels of Coccidiosis and Salmonella in chickens by the increasing of gut flora. The product is registered as BI-OSTROSIN. Administration can be done orally or in drinking water at a dosage of 1 ml per chicken per day, once per week of the first 3 weeks. BIOSIN has a shelf life for longer than one year, under dry, cool conditions. The product is hygroscopic and it may become syrup-like. After mixing, the product will be usable for up to a month at room temperature. It is preferable to store BIOSIN in a fridge after it has been made up. It will be usable for up to 6 months. The product has a typical sour smell.